Results have been released from a survey conducted by the Bicycle Transportation Alliance (BTA) last August. The intent of the survey, titled Bicycling Perceptions and Experiences in Oregon and Southwest Washington, was to garner feedback and data on a wide range of topics related to bicycling, advocacy, and the BTA itself. The survey had 2,002 total respondents, 1,000 of which are current BTA members. The fact that people who regularly ride bikes also own cars has already been used by the BTA to lobby in support of a $19 motor vehicle registration fee to pay for the Sellwood Bridge. 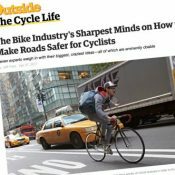 BTA executive director Scott Bricker told us that the survey was an attempt to capture the feelings of the portion of the general population that cares about bicycling, and that he feels confident that it was successful in doing so. The bulk of the survey (which is still online) focused on gauging perceptions of the BTA and feedback on the BTA’s program and advocacy priorities going forward. However, results of those questions have not been released (we’ve asked the BTA to see them, but have not yet heard back — UPDATE (11:05am) we have just gotten the full analysis and a statement about it from Bricker. We’ll do a separate about that portion of the survey results). To administer and interpret the survey, the BTA hired Portland-based firm Inavero Institute for Service Research, which specializes in client satisfaction surveys. Eighty-nine percent of cyclists also own at least one automobile. 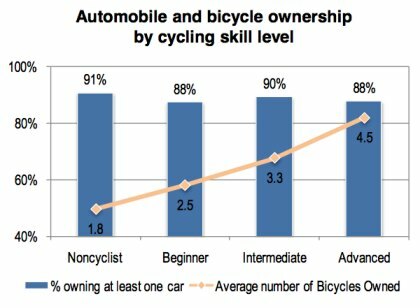 The average number of bicycles owned increases as skill level improves [a good economic argument to encourage bicycling!]. In Northeast and Southeast Portland, 15% of respondents say they don’t own a car. The percentage of trips taken on mass transit drops as the skill level of cyclist increases [likely because it’s cheaper and faster]. 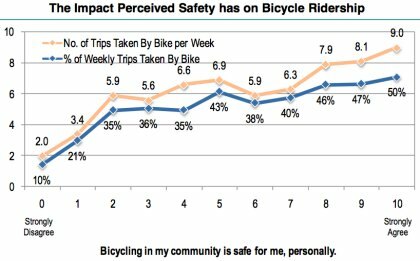 As people’s perception of bike safety increased, so too did their amount of weekly bike trips (see chart below). Results of survey showed that as people feel safer, they ride more. Read this news on oregonlive. Most comments still felt that cyclist were not “paying their way” and would not support bike infrastructure. Even when proven wrong people still feel the need to defend ignorant opinions. By the way, there were many questions on this survey that the BTA did not release initially (until we asked). I’ve posted a separate story about it. Eugene? Is Eugene a bike friendly city, and if so, has the police department been helping to make it so? 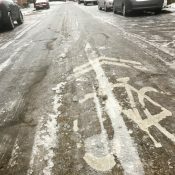 In bikeportland’s forums, a Eugene resident posted an account of a hit and run that he was the victim of, and some details of his ongoing effort to have the driver take responsibility for those actions. Read the entire thread if you like. I linked to this particular comment because the OP included in it, a link to a story about the Eugene police department by eugeneweekly.com, not directly related to the hit and run, but having to do with the Eugene police department’s sense of responsibility to uphold the law and protect people in Eugene. I just read the OregonLive article and yeah, they don’t buy it. 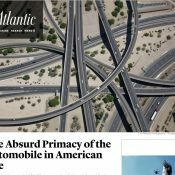 What I want to know is, when do we start taxing car drivers for pollution? The exhaust I breath everyday on my way to work is awful. Waaaaay worse than secondhand smoke, for example. I’ll liscence my bikes when they pay for ruining the air. I would post that in OregonLive, but for some reason my work blocks posting there and not here. @wsbob- Yes, Eugene is very bike friendly! I feel much more comfortable biking here than in Portland. Yes, Portland is great and has leaped ahead of Eugene in some innovative bike infrastructure (and a few other things) but Eugene is still much smaller with more quiet neighborhood streets and no freeways running through it’s downtown area. That being said we are only Gold and not Platinum and we still have a lot of improvements to make, including improving the relationship, enforcement, and education of the local police. My perception of bike safety increased greatly after I started riding every day. A ditto to Carl B.’s comment for me. I was a regular rider in Boston and Seattle for many years and I felt completely safe even on Boston’s streets. I restarted biking on a daily basis in the past two years here in Portland (when we dumped our second car). When I restarted biking on a regular basis, there were streets that I was initially uncomfortable with that I am now very comfortable with even though there has been no changes infrastructure in those areas.